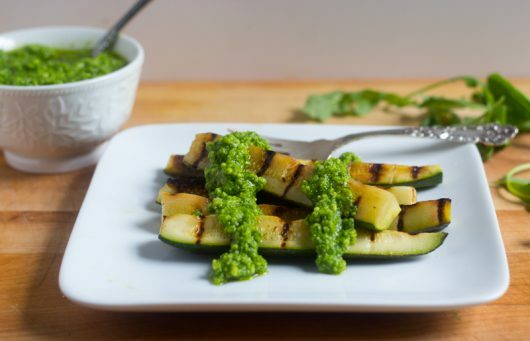 Did you know that grilled zucchini and garlicky arugula pesto are a match made in heaven? I did not, until I tasted the dynamic duo at The People’s Pub in Chatham, NY, a few weeks ago. I couldn’t wait to reproduce this deliciousness at home, and share the step-by-step recipe with you. 2) It’s the ideal make-ahead dish for a picnic or potluck gathering! 3) You don’t need an outdoor grill for the zucchini! 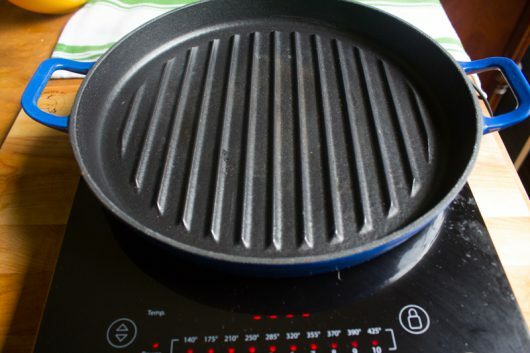 I grilled mine indoors, on a common grill pan. 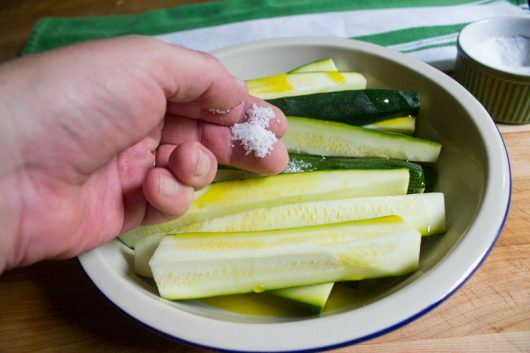 To start, grab 4 small zucchini (roughly 2 pounds total), and trim the ends. Then cut the zukes lengthwise into quarters, and pile them into a shallow dish. And a sprinkling of salt and pepper. 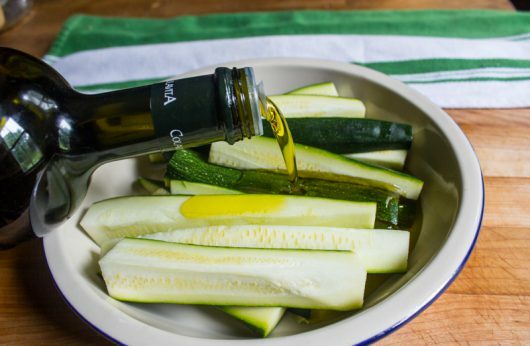 Toss to coat, making sure that every zucchini spear is slick with oil. Next, pre-heat a greased (or non-stick-sprayed) grill pan over medium-high heat. 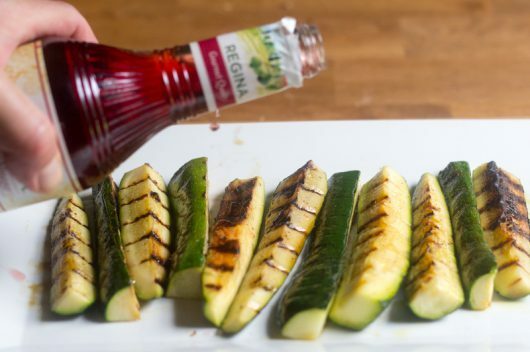 You can, if you prefer, grill your zucchini on an outdoor grill. I’m an indoor cook. 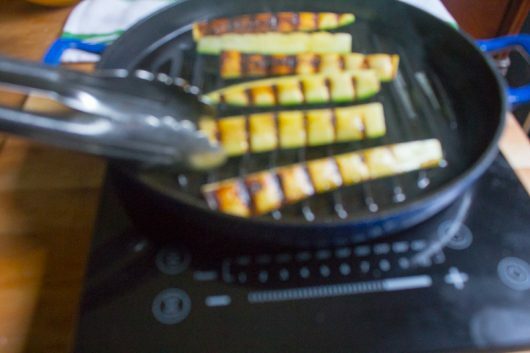 Grill the zucchini, turning the wedges every 5 minutes or so, until all 3 sides are equipped with caramelized grill-marks. Arrange the wedges on a platter, douse them with a little red wine vinegar, and let them cool to room-temperature. Meanwhile, let’s make the pesto! 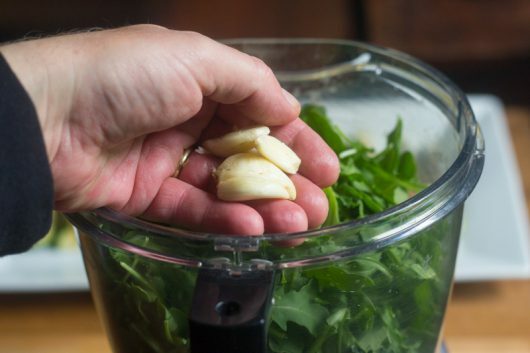 First, drop 2 big handfuls of baby arugula leaves into the bowl of a food processor. Yes, I mean handfuls. There’s no need to measure the leaves! And 1 whole cup of grated Parmesan or Asiago cheese. Blitz the works for 10 seconds. 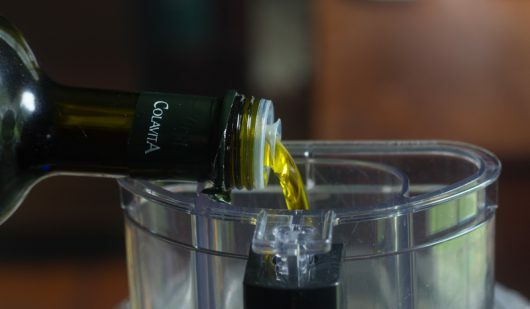 With the machine running, add extra virgin olive oil through the feed tube until a thick but spoon able pesto develops. Now taste the pesto! You might like to add a pinch of kosher salt. 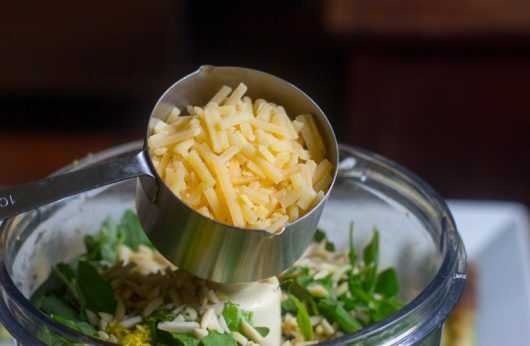 Transfer the pesto a bowl. Note: At this point, you can cover the bowl of pesto and the platter of zucchini with plastic wrap, and refrigerate them for up to 24 hours. Yes — this is a dish that will wait for you! 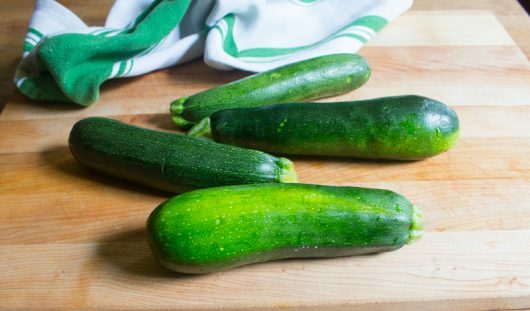 Divide the zucchini spears among plates, top them off with 2 or 3 spoonfuls of the arugula pesto, and then brace yourself for powerful new taste sensation! A dynamic duo that belongs at your next dinner party, picnic, or pot luck. Serve cold or at room temperature for best flavor. 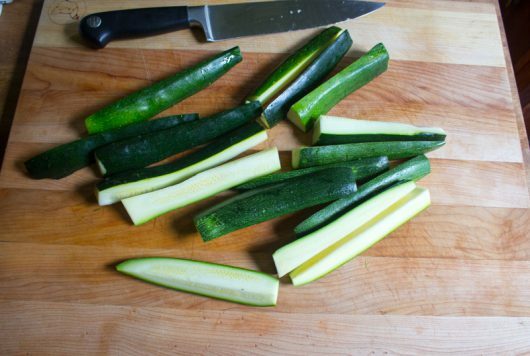 Trim the ends off the zucchini, then cut the squash lengthwise into quarters. 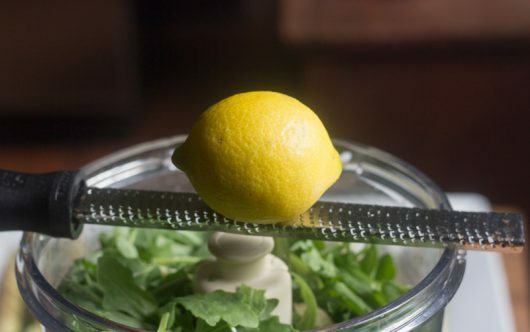 Pile the quarters into a shallow dish, and add enough olive oil to coat them. Sprinkle with the salt and pepper, and toss again to coat. Grill the zucchini on a grill pan set over medium-high heat, turning the wedges every 5 minutes or so until all 3 sides are equipped with grill-marks. Transfer the wedges to a platter, and drizzle them lightly with the red wine vinegar. 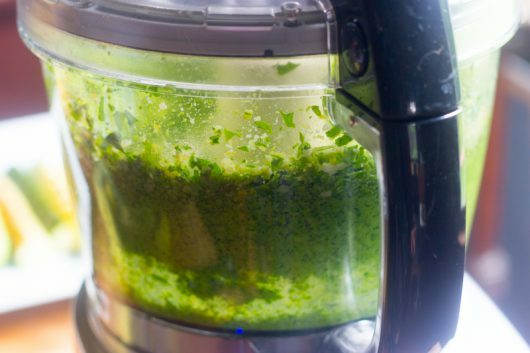 Let cool to room temperature while you make the pesto. 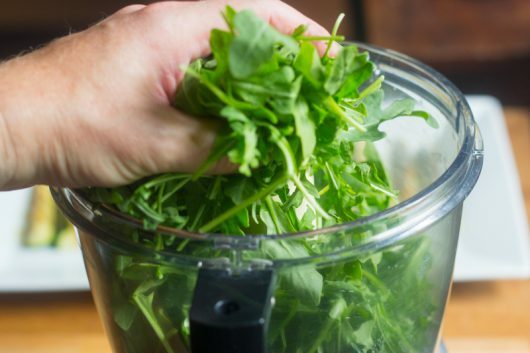 Drop the baby arugula leaves into the bowl of a food processor. 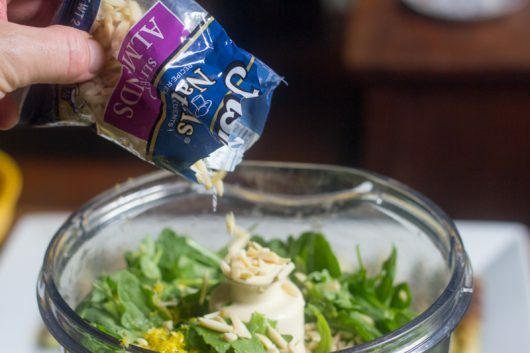 Add the garlic, lemon zest and juice, almonds, and cheese. Process until a coarse puree develops -- about 10 seconds. 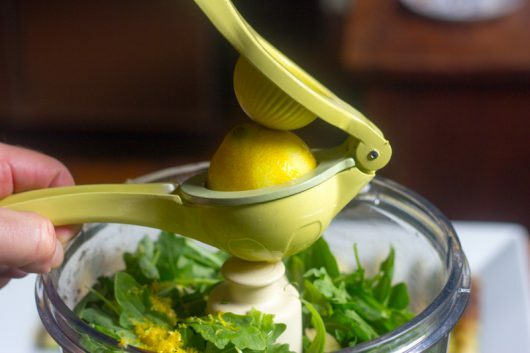 With the machine running, add enough olive oil through the feed tube to achieve a sthick but spoon-able pesto. Taste for seasoning -- you might like to add a pinch of salt. 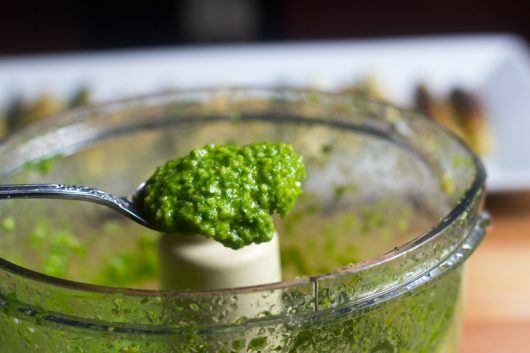 Transfer the pesto to a small bowl. To serve, divide the zucchini among plates, topping off the zucchini with 2 or 3 spoonfuls of pesto. NOTE: If your grill pan is not "non-stick," coat it with vegetable spray before adding the zucchini wedges. Absolutely delightful!!! Tender crisp zucchini…the pesto is lemony- garlicky- nutty- cheesy wonderfulness (that you’ll be tempted to lick the plate to get every last bit of!!) This will be a win for whatever summer meal you present it at!!! Thanks for sharing Kevin!!! Hi Brenda – Thanks for taste-testing the recipe! The dish sounds yummy. I like all the ingredients…but you lost me on this one with “room temperature”. I’m going to try it hot! I am always looking for new ways to use zucchini and this one is tops! I’m looking through all your recipes and ideas…LOVE all you silly comments, they make life light and fun! Hmm I tried it and loved it except that the garlic I chose was hot! My tongue still tingles and it’s been hours since we ate them. I’ve had hot garlic before but I don;t know how to tell till its too late. We have had so many cool, rainy days in our Adirondack garden, that the Arugula has gone a bit crazy. I’m happy to have this new way to use it all. Tonight was my second time to serve this recipe and I’ve frozen small packages of the pesto to use on Brie later. I substituted sunflower seeds this evening. Thank you for a new favorite and our best wishes for a happy outcome with your eye surgeries!